When Strong Families asked me to write a post for their Mama's Day blog series I humbly and excitedly agreed! 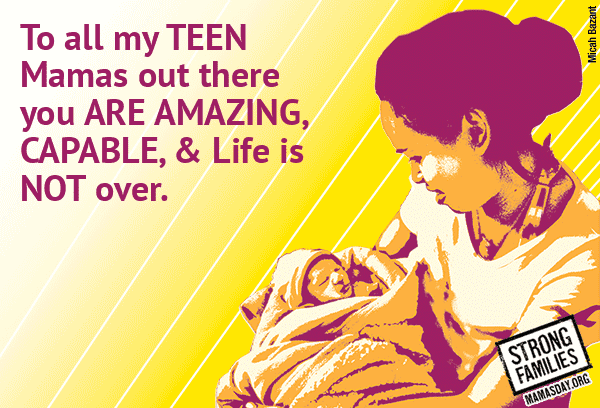 This letter is to all my teen parents out there and to all the people that seek to put us down. Keep your head held high! I see you! I appreciate you! You ARE amazing! An E-card I made for all my peers! 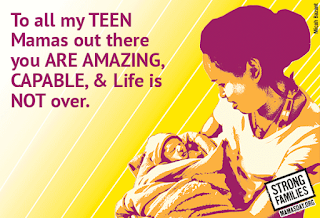 The problem with being a teen mom is that I don't hate myself nearly as much as you wish I did. My humble pride and my happy life upset you because I do not embody the self-hate and stereotypes you want me to. My existence challenges everything that you’ve been told to believe about me, which makes you uncomfortable. And instead of getting to know me, you cast hate and anger at me. Hoping that your negativity will tell me to quit, hoping that I will amount to the nothing you desperately want me to be, and hoping that your negativity will give you a voice for a moment. I am a proud teen mom. My family is happy. I graduated high school on time and with honors. I am a college student, and I am looking for a Master’s degree program. I've been published in The New York Times and other major news publications expressing my views. My daughter is intelligent, healthy, and happy. I'm on my way and I won't let you get in the way. When you do choose to hear my accomplishments, you seek to belittle and change them so they make you feel comfortable: Read the rest of my post!